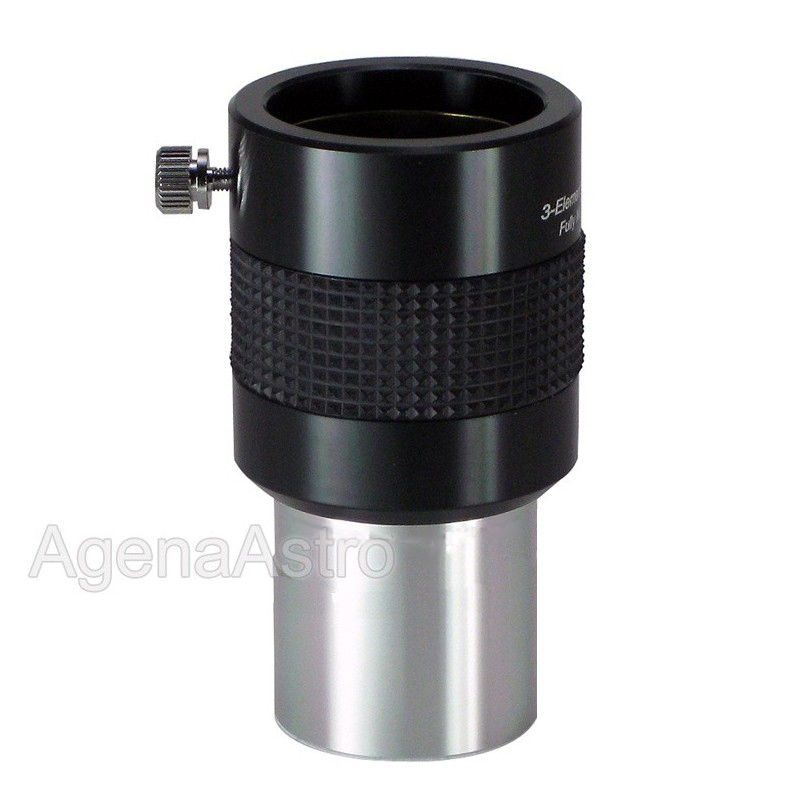 If you need more power than your eyepieces alone can provide, we offer a new apochromatic 2.5x Barlow lens from GSO (Guan Sheng Optical) to give a big magnification boost to any 1.25" eyepiece it's used with. Nothing has been compromised in GSO's latest and finest offering. This Barlow features an air-spaced, three-element, apo design with fully multicoated optics. The housing is precision machined from aluminum stock and black anodized to a hard finish. The lens edges and inner barrel are blackened to provide maximum contrast. The Barlow body includes a brass compression ring so that your eyepiece barrels are not marred by the captive set screw. The 2.5x model has a clear aperture of 23mm. For those who need a very high quality Barlow for all-round use, the 2.5x barlow is a very nice step up from the typical 2x achromatic barlows commonly found on the market. 4.8 (Based on 38 Reviews) 95% of reviewers recommended this product. I compared the GSO 2.5x apo barlow to a TeleVue 2x I had. First, this barlow functions as a 2.1x barlow, not a 2.5x. In any event, on Almach, the beautiful pair was easily separated in my 17mm Sterling Plossl and looked simply beautiful, orange primary and light blue secondary. But with the same eyepiece, the TV 2x barlow put up two dull, barely colorful stars. Maybe they were sharp, but dull and washed out doesn't cut it for colorful double stars. Sold the TV 2x and the GSO 2.5x apo barlow has a permanent spot in my eyepiece case now. Fit and finish as good as any higher priced brand barlow. Optically does a quality but not premium quality job. Very good glass and build quality. This piece makes a big difference in the size of the planets, very impressive. Excellent product. I am very satisfied. I have compared this barlow with a 2.5X powermate and it compares very favorably. The powermate performs a little better but not enough to warrant the extra cost. I use it with my mak to get good planetary views with my plossl eyepieces. Review by Blowfeld of Liverpool, UK. Very easy to use and, when combined with a 10 mm eyepiece, the Barlow excels in fine focus. Best additional purchase to my new 6" Dobsonian. Review by registered alien of Registered alien Osaka Japan. Review by TomH of Crossville, TN. Good three element barlow for the money. Review by Dewi of Alexander, NC. This GSO barlow is the best I have found for general use. I use Explore Scientific and TV eyepieces and this barlow magnifies without significant reduction of brightness or clarity. For the price you can't beat this barlow. Review by Ray the StarGeezer of Modesto, CA. I call this a very good barlow. If I could, would give it 4.5 stars for performance (but I rounded up, so it gets 5). Not perfect on all targets with all eyepieces but very satisfactory on nearly all. The ergonomics are very good, fit and finish excellent. No gripes for the price. Used in a 5.5" refractor. Review by Herb of Irvine CA. 5.0 Excellent Barlow for the Price! Review by Jeff of Conroe, TX. I use this on my refractor and my MAK. It has nice glass and pulls in the views. No need to pay more. Excellent quality ... compared it to several more inexpensive Barlows (including an Omni 2x) and this one is the best and sharpest. Very happy and well worth the money! Review by rd726 of Indiana. Nice shorter Barlow that works great. For most of my eyepieces it more along the lines of 2.2x than the listed 2.5x but that is what happens with most Barlows. This barlow offers a quite useful alternative to the 2x and 3x standards. Very nice build quality and so far great performance. I may have rated it five stars had I used it more, but so far on lunar work its seems to offer no apprecialble loss of clarity or color fidelity. Agena's delivery was breathtakingly fast, as usual, which is why I try to order from them whenever I can. In short, excellent product for the price, with fast delivery. I use this a bit for visuals on planets, but where it's really helped is with planetary imaging. I use this in my 900mm focal length refractor and an imaging source planetary cam and have been really impressed with the images I've been able to get. I've shot Saturn with that set-up, and get clearly defined bands on the planet as well as a very clear Cassini division in the rings. Very happy with this barlow! Review by Eddie of Brazil. Nice Barlow, with good contrast at low to medium magnifications. The barrel is very well machined. In summary, very good value..
Review by Gustavo of Isabela, Puerto Rico. I use it for imaging planets with my C8 SCT and NexImage CCD. It gives a focal ratio of F/25, which I think is about the maximum that I am willing to go with that scope. The barlow looks like a quality item, and performs perfectly. Review by Bob the Burglar of Petaluma, CA. The seeing conditions on 6/23/2012 were great where I live, so I took my C8 out and aimed it at Saturn. I checked this Barlow out with every eyepiece I have and the results were fantastic. I even used it with my Televue 8 mm EP and the view of Saturn was still fantastic. I decided to aim at Arcturus and see if I could get an Airy disk, but seeing was not quite good enough to get a stable image. There is only one drawback. My Celestron 26 mm Plossl (made in Taiwan) wouldn't fit into this Barlow (also made in Taiwan) but my 32 mm Omcon Plossl (made in the same factory as the Celestron EP) did fit. Well...nothing is perfect, but this Barlow is a great deal, and great service from Agena. Review by Jim of Colorado. Review by jonastro of Greensburg, PA.
Review by Philippe of Meaux - France. This item is a good complement to the 2" ED barlow when watching planets with a 2" crayford focuser. The strong construction allows to mount a digital camera. Review by astro dj of St. Louis, MO. I have an early Televue 2.5x barlow I use, and I wanted another less expensive 2.5x barlow for my young sons to use with their scopes (80mm f/5, 130mm f/5). This is a great barlow! We looked at M13 with the 130mm scope, and M57 with 80mm as test objects. Limiting magnitude for the unaided eye was 4.5 due to light pollution. A Meade 13.8mm series 4000 eyepiece (early 90's, Japan) with a 68 degree apparent field was used on both objects. With the barlow this provided magnifications of 72x for the 80mm, and 117x for the 130mm scope. No image degredation could be detected in either case. Both objects were sharp and clear with pinpoint stars. The barlow did its job of increasing power enough to render a more pleasing size to the objects with out any noticable loss of sharpness at all. I would say it performs as well as my old Televue, at less than half the cost. Review by hav2tinker of Tennessee. 5.0 Compares to more expensive Barlows!! Review by MG Noosa of Queensland Australia. Great little Barlow used with Vixen SF80 and Celestron C6, very happy, highly recommended, good value for money. Review by okydoky of Denver,CO. I use this primarily for Astronomy, mainly looking at the Moon with a 10mm and 15mm eyepiece. Barlow is well made and great care has gone into providing a quality product. The views I get while using the barlow are much better than an older barlow...I used to use! Review by juanirias of Honduras. 5.0 Very nice to have!! I use with my ETX-125, High quality on a budget!!! 5.0 Best barlow for the money. I bought this in combination with two EWA (UWA) Agena 15mm and 9mm EP. Before I had no barlow and only celestron 25mm and 10mm EP. WOW. The difference is incredible. All the new equipment feels very durable, and well made. It further proves that with how well I am able to see Jupiter (when weather permits ATM). I wish I would have got the set to save some cash, which is nearly the amount of one of the EP's. Only thing I've noticed is the shorter tube for the barlow. I tried added two filters on my 9mm EP and I hit bottom before the EP section could go down far enough for the compression ring to hold it properly. Not too big of an issue though. I can always add them to the bottom of the barlow instead. Review by unitron of Eaton, CO. This does not have quite the clear aperture of the famous Celestron Apochromatic 2X Barlow, but at 2.5X, it really can't, and I needed that extra 0.5X with my short focal length scope. Truly a great find - you won't be disappointed with this. Review by Surya of Milan North Italy. Using for planetary photos and general observing. Built like a tank! Nice looking. Review by S. Firestone of Jackson, MS.
5.0 Excellent barlow, inexpensive price. I ordered this GSO barlow lens to replace the dime-store plastic barlow lens that came as part of a telescope kit I obtained elsewhere. When the package from Agena arrived, the product exceeded my expectations. The all metal construction is top notch. The fit and finish on this barlow lens gives you the impression that it would cost at least twice as much as it does. It is far better constructed than a lot of my DSLR camera lenses that cost 3 to 5 times as much. The improvement over the original barlow lens is apparent at first use. The barlow does not significantly impact the visual quality of the eyepieces used. This is in sharp contrast to the original barlow which degraded even my 30mm eyepiece. This barlow removes one poor link in the optical train. One thing I noticed immediately was that this barlow lens appeared to make my plossl eyepieces parafocal. With this barlow attached, I don't need to refocus when changing eyepieces. That was an expected plus. If the quality of this barlow is any indication of the quality of the GSO line of optics and telescope parts, I will definitely be purchasing more from them. Agena Astro products was extremely easy to do business with. I will definitely do business with Agena again. I picked up the GSO 2.5x Apo Barlow because I was unhappy with the performance of "another" brand that I had been using. Granted, the other brand was a bit lower in price but the difference in quality, in my opinion, was well worth the few extra dollars. The GSO Apo is a real bargain. The barlow is well machined, short (3" overall), and light weight. Just handling it gives the feeling of a nicely crafted item. The undercut on the lower barrel is "just right". There's nothing that I hate worse (well, almost nothing) than an eyepiece, barlow, or any accessory getting hung up on the undercut because they're cut too deep. I usually end up with the set screw backing all the way out and falling in the grass. Then I'm crawling around in the dark...looking down instead of up! The views using the GSO apo barlow are excellent. Nice wide, clear aperture of 23mm and the barlow becomes invisible in use. That is, you don't even know that there's more glass between the eyepiece and the scope. I look forward to more clear nights and a chance to enjoy the barlow even more.